Heat oven to 400°F. Line 15x10x1-inch pan with foil or cooking parchment paper. In large bowl, toss sweet potatoes with 1 tablespoon of the oil, the cumin and salt. Place potatoes in single layer on pan. Roast 30 minutes or until tender and light golden brown around edges. Meanwhile, in medium bowl, mix sour cream, half of the lime juice and 1 tablespoon of the chipotle chiles (add more chiles for spicier slaw). Add shredded cabbage; toss to coat. Cover; refrigerate until serving time. In 10-inch skillet, heat remaining 1 tablespoon oil over medium heat. Add garlic; cook and stir 30 seconds or until lightly toasted. Add black beans; cook, stirring occasionally, until thoroughly heated. Stir in remaining lime juice. 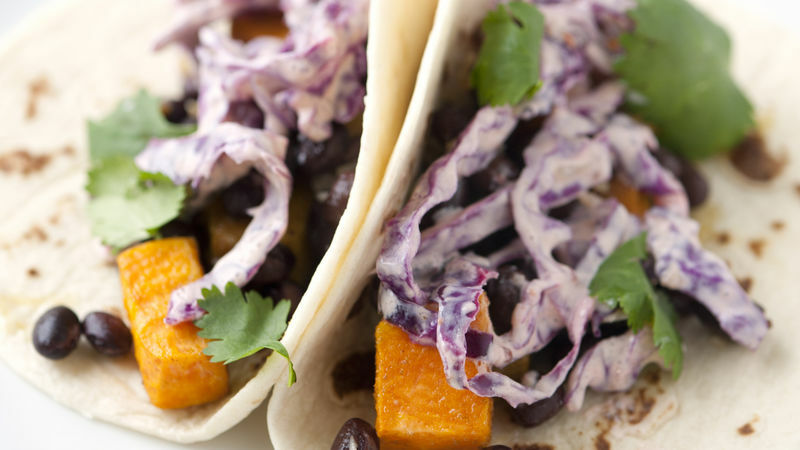 To assemble tacos, spoon sweet potatoes and black beans onto each warmed tortilla. Top with chipotle slaw and cilantro. Fold tortilla in half over filling. Serve with lime wedges. Chipotle chiles in adobo sauce can usually be found in the international section of the grocery store. The chipotle slaw can be made up to 1 hour in advance.